Don’t do guest blogging to get links, they said. And don’t use guest bloggers to create content for your site. Just cut it out. Guest blogging is not dead. Google hates repetitive, spammy content, but as long as your guest post is original with good to great quality on a site known for quality content (like this one), Google is fine with it. Getting links from authoritative sites is a great way to raise a domain’s search ranking. (Unless, of course, if the site, like Medium, only provides a no-follow link, then it’s not going to help.) The traffic from the site probably helps, too. Social sharing, especially from popular accounts, is beneficial, too. Let’s look in more detail at each of these lessons. Not just in the marketing space but in business generally, countless high-quality sites use guest bloggers on a daily basis. These include Harvard Business Review (which publishes several guest posts a day), MarketingProfs, HubSpot, Forbes, and on and on. One of the most important things to remember about guest blogging is that each site has its own rules and guidelines on the type of material it wants. A couple years ago I approached a major publication about doing some guest interviews for them. They declined, as they limited interviews to their staffers because some guest bloggers had used the interviews to promote clients. (My first interview suggestion was a principal at another agency, so clearly that conflict wasn’t the case for me, but the major publication stuck to its rule.) I then approached a major blog and learned the editor had just been talking about wanting to run more interviews. The result was a series of interviews with prominent sales and marketing leaders that I later collected into an eBook. Upon starting a new company last April I had a search problem. After considering many names, I settled on “revenue + associates.” The name succinctly communicates my focus on helping companies generate more revenue and using a wide range of experienced marketing and sales partners to achieve that end. It’s a lot more memorable than something like Gudema & Associates. At virtually every event I attended, someone, usually fairly senior, would point to my name tag and say, “Revenue and associates! I like that name!” I knew I had made the right choice. But Google reads my company name as “revenue” and “associates” and that search delivers over 95 million results. My site wasn’t at or close to the top. People who searched for my company by name were unlikely to find me. I previously suffered this dilemma. In 1998, just a few months after I started a company called Magic Hour Communications, former NBA great Earvin “Magic” Johnson launched a talk show called The Magic Hour. My search rankings sank under a ton of coverage for his show. Fortunately for me, the show was cancelled after only three months, but it still took another 12 to 18 months for that coverage to wither away and Magic Hour Communications to rise high on page one again. So I had to do something about my new company, revenue + associates. Search engine optimization is important in search rankings, of course. 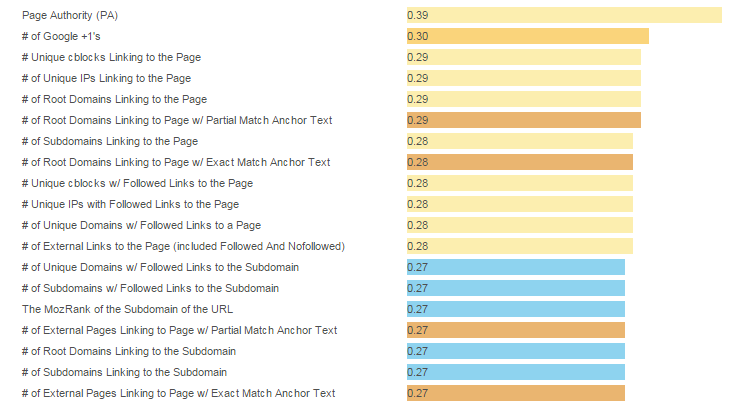 Using appropriate keywords in the page’s title tag, having a search-friendly (rather than merely clever) headline, adding H1 tags, etc., can make a significant difference in a page’s ranking. The more cues to Google the better. But as the Moz survey of search engine ranking factors shows, far more important than the on-site factors are links to the site and page. So I figured that guest blogging would be the fastest way to get links from other authoritative sites, even if Matt Cutts said it was dead. 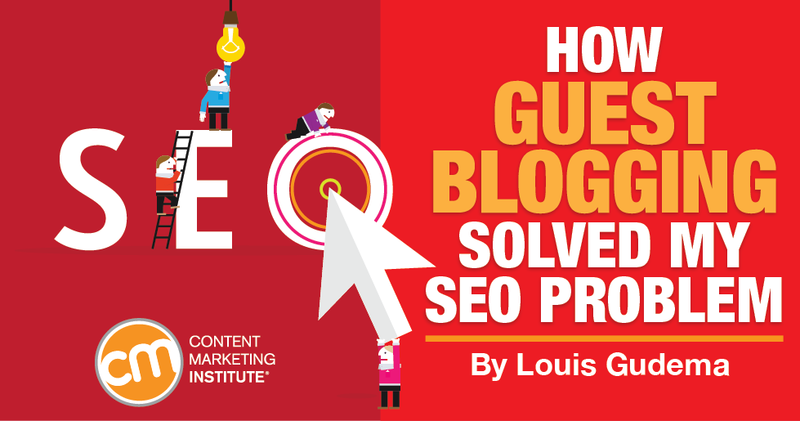 I already had been guest blogging for authoritative sites such as Econsultancy and IDG Connect. Getting links from them to my new revenue + associates site was fairly easy because I just updated the bio information that appears at the end of each post. Around the same time I conducted original research on mid-market companies’ adoption rate of marketing technology. What I discovered in my research was fairly sobering: Outside of the software industry, few companies are using marketing technology. That research created more opportunities for guest blogging on authoritative sites such as TechTarget and VentureBeat. In the summer I published an eBook that compiled interviews with 10 sales and marketing leaders that I had done over the previous year for IDG Connect and other sites. This gave me the opportunity (and introductions) to not just write guest posts for HubSpot and MarketingProfs, and do a point/counterpoint on chiefmartech.com, but to gain additional tweets, links, and shares to the eBook from my interview subjects who had tens of thousands of followers. I found that about 2% of the people who read a particular post (based on the numbers the host sites gave me) clicked on the link on my profile and came to my site (based on my site’s Google Analytics). Google was no doubt aware of this increase in traffic to my site and that must have figured into its rankings for revenue + associates. The sites for which I was guest blogging usually tweeted about my posts, too. They often used my Twitter handle. (Interestingly, some sites, such as TechTarget, are much better about socially sharing the work of their guest bloggers than others.) And, of course, those social shares led to additional tweets and shares with mentions of me. Some of those people came to my site, too, etc. With Google Analytics on my and virtually all sites, Google is well aware of factors such as social links, traffic to site, etc. It’s all good. By November, when I wrote a blog post for the Harvard Business Review website, it was icing on the cake: My revenue + associates site was already ranked No. 1 by Google when searching on my company name. Guest blogging lives. Problem solved. Want to connect with authoritative content marketing outlets and learn more about great content creation and distribution. Check out the CMWorld 2014 sessions available through our Video on Demand portal and make plans today to attend Content Marketing World 2015. Louis Gudema is the president of revenue + associates, which helps companies increase revenue through measurable improvements in sales and marketing. He has over 25 years of marketing experience, including 15-plus years of digital marketing experience. Aside from his company site, he blogs on sales and marketing and can be reached through Twitter and LinkedIn.